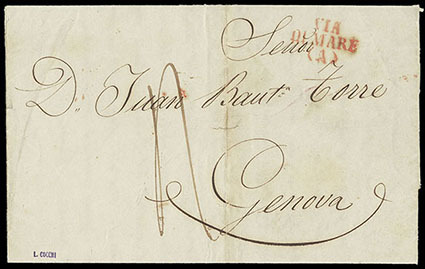 Italy, Via De Mare (A), red handstamp on 1845 incoming folded letter from Lima, Peru to Genoa, carried without involvement of the Peruvian mails, manuscript "4" decimi due upon arrival and corresponding date stamp on reverse, Very Fine, a rare usage on mail originating from Peru. 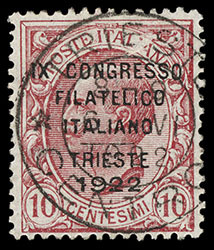 Italy, 1922, Trieste Philatelic Congress complete, the complete set canceled by single strike of Trieste Congress slogan machine cancel (with values in ascending order) two days after issuance, Very Fine. Sassone No. 123-126. 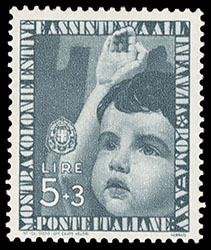 Italy, 1937, Child Welfare complete, o.g., never hinged, fresh and pristine, Very Fine. 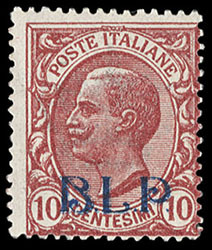 Italy, 1921 Victor Emmanuel III 10c claret, litho overprint "B.L.P." in blue, full o.g., rich color, Fine. Sassone No. 1. 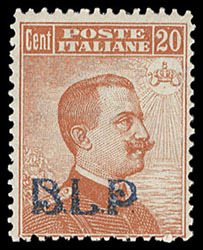 Italy, 1921 Victor Emmanuel III 20c brown orange, litho overprint "B.L.P." in blue, o.g., never hinged, fresh with rich color, Fine, very scarce never hinged; signed E. Diena. Sassone No. 2. 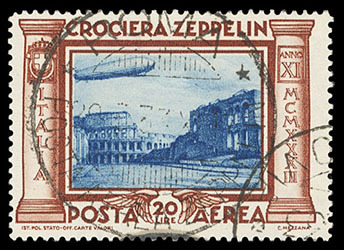 Italy, Airmail, 1933 Zeppelin complete, Zeppelin circular date stamp cancels, rich colors, a Very Fine set. Sassone No. S.1508. 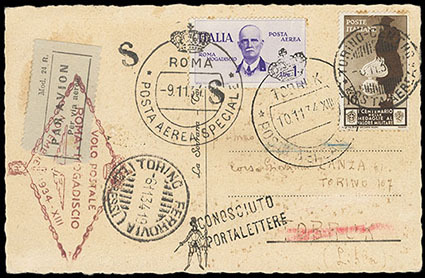 Italy, Airmail, 1934, 1L Rome-Mogadiscio Flight, in combination with 1934, 10c dark brown (331) on flight card to Libya, 10c tied by Torino cds and 1l airmail by Roma special flight cds, red flight cachet; some light tone spots, F.-V.F. Sassone No. 83. Scott No. C73 Estimate $200 - 300. 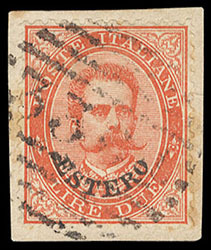 Italian Offices in the Levant, 1881 Humbert I 2L vermilion, tied on piece by "3364" barred oval of Sousse, Tunisia, rich color and beautifully centered, Very Fine, an interesting and rare cancelled-to-order example of this unissued high value; with 1981 Sorani certificate. Sassone No. 17. Scott No. 17 Estimate $250 - 350. 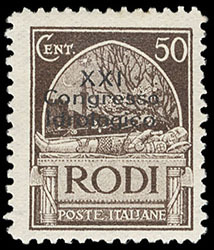 Italian Occupation of Rhodes, 1930, 5c-10l Congress issue complete, o.g., hinge remnant, choice overall centering, rich colors, a Very Fine set, very scarce. 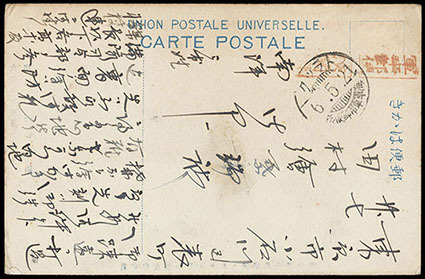 Japan, 1917 Japanese Naval Occupation of Caroline Islands, 1917 (May 21) Stampless picture postcard (showing Japanese naval officers and crew) with two military boxed handstamps in red overstruck by "Truk, Kaigun Gunyo Yubin Sho" postmark, Very Fine.